Covering almost two million sq km (800,000 sq mi), Mexico follows a northwest to southeast curve, narrowing to the Isthmus of Tehuantepec then continuing to the Yucatán Peninsula. Mexico is a mountainous country with two north-south ranges framing a group of broad central plateaus known as the Altiplano Central. 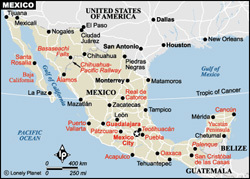 In the south, the Sierra Madre del Sur stretches across the states of Guerrero and Oaxaca to the Isthmus of Tehuantepec. The flat, low Yucatán Peninsula is tropical savanna to its tip, where there's an arid, desert-like region. Bridging temperate and tropical regions, and lying in the latitudes that contain most of the world's deserts, Mexico has an enormous range of natural environments and vegetation zones. Despite the potential for great ecological diversity, human impact has been enormous. Before the Spanish conquest, about two-thirds of the country was forested. Today, only one-fifth of the country remains verdant, mainly in the south and east. Mark Olson says: Mexico is one of the most diverse countries on earth. Most of tropical Mexico is seasonally dry, and the wildly rugged and varied topography has led to a fantastically colorful and striking biota.